Step 1 Heat a 3- to 4-quart saucepot over medium-high heat. Add the vegetable oil followed by the sliced garlic. Cook the garlic until golden brown and fragrant, about 2 minutes, careful not to burn. Immediately add the sliced shallots and cook for about a minute, stirring frequently. Step 2 Stir in the stock, lemongrass, ginger, galangal, kaffir lime leaves, halved jalapeno, star anise, cinnamon and tamarind to the pot. Bring to a simmer, then cover the pot and simmer gently for 20 minutes. Step 3Remove from heat and strain the broth through a fine mesh strainer, discarding the solids. Return the broth to the pot and add the coconut milk, fish sauce, sugar and salt, and bring back to a simmer. Step 4Add the eggplant and tomatoes. Cover once again and cook until the eggplant is tender but has not lost its integrity, 5 to 7 minutes. Add the turkey meat and remove from heat. Ladle the hot soup into large bowls and serve with sliced green onions, thinly sliced jalapeno, herbs and lime wedges on the side allowing for each person to finish to their taste. In Recipes-list.com we have selected the most viewed recipes from category - Leftovers Main courses Soups . Enjoy the best recipes specially selected for you! 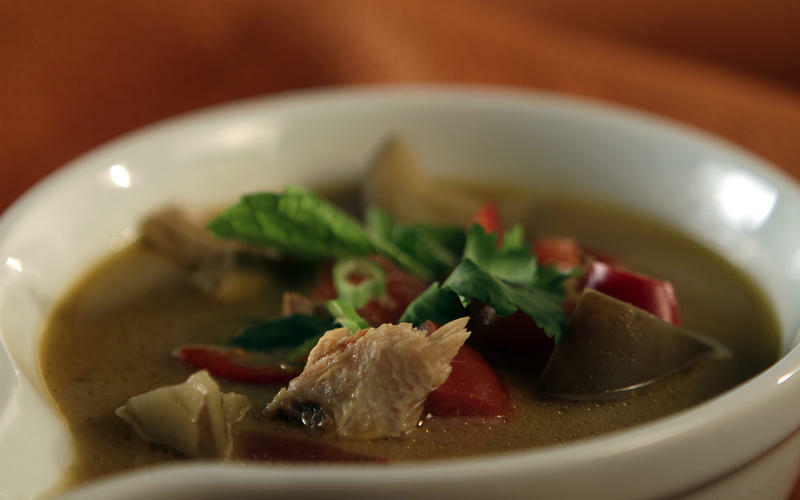 Thai-style turkey soup is the right choice that will satisfy all your claims.